The calculator panel that was supplied with the T Power Control 1 is for non-automatic flash with 50mm lenses (including the Zuiko Auto-Macro 50mm f/3.5) and the T10 Ring Flash 1. Calculator panels for the Zuiko Auto-1:1 Macro 80mm f/4 and the Zuiko Auto-Macro 135mm f/4.5 lenses with the T10 Ring Flash 1 were available as accessories. There was also a calculator panel for 50mm lenses with the T28 Macro Single Flash 1. 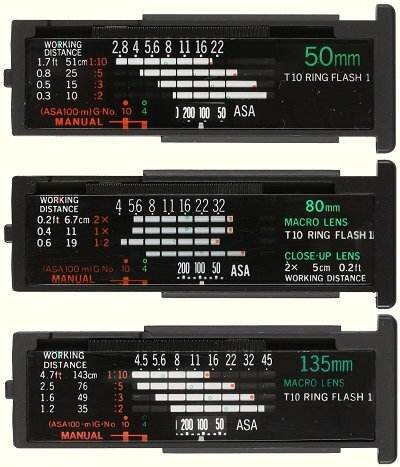 All of the macro flash calculator panels have distance scales in both feet and centimetres, unlike those for the T32 Electronic Flash, which have separate feet and metre versions. Unlike the panels for the T32 flash gun, those for the macro flashes do not include a setting for conventional (non-TTL) automatic flash. This is because the macro flashes and bellows or macro lenses block the sensor in the “O” of the Olympus badge on the Power Control. Only one version of each panel is known. 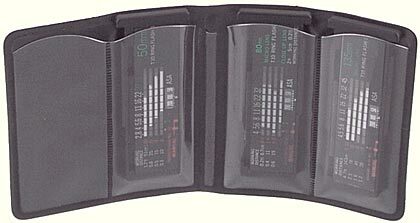 A plastic case with pockets for four panels was supplied with the T Power Control 1, and was also available separately. The original calculator panels for the Power Control are for use with the T10 Ring Flash 1. After the other macro flash units were introduced, a sheet of 14 self-adhesive labels with information for these units was supplied with the T Power Control 1. The labels include new distance and aperture scales for the various flash unit/macro lens combinations, but only for 100 ASA film. Instructions were not provided with the Calculator Panels.